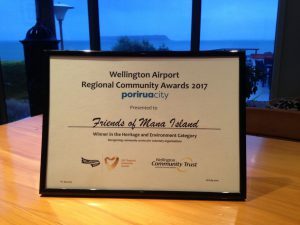 We were delighted to win the Heritage and Environment category award last night at the Wellington Airport Regional Community Awards for Porirua event. It’s a major endorsement of everything our volunteers have done over the years. We recognise the support and direction provided by our partners on Mana Island – DOC and Ngati Toa. 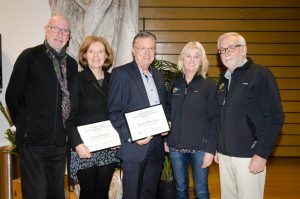 FOMI and the other winning community groups from Porirua will join winners from around the region for the Regional Award finals in late October. Here is the video screened at the finals event. 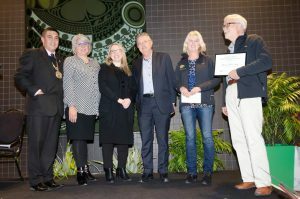 At Porirua awards ceremony, from left, Porirua Mayor Mike Tana, Liz Kelly (Wellington Community Trust), Jo Maxwell (Wellington Airport), Brian Bell (FOMI president), Philippa Sargent (FOMI exec), John McKoy (FOMI exec). FOMI people – Brian Paget (past president), Linda Kerkmeester (vice-president), Brian Bell (president), Philippa Sargent (exec), John McKoy (exec).